Today’s Write 31 Days prompt is: Audience. I have what my biopsist described as a “nice crop of nodules” on my thyroid. It’s uncomfortable to swallow, talk, and/or breath. Makes hiking a real treat. I don’t think it’s a coincident that I’m having issues with my throat. Verbal wording is hard. For as long as I can remember, I’ve had trouble talking in a way that’s transparent. I’ve had trouble living in a way that’s transparent. I’ve talked about being a chameleon before. It’s not so awesome. Especially the having to lick my own eyes part. My internal censor is oh so very concerned with not offending the imaginary audience. The thing is, I don’t need to connect with everyone, and not everyone needs to connect with me. That’s chameleon talk. That’s my child-self, scared of being abandoned or threatened or physically hurt. I feel for that kiddo. She needs more fuzzy blankets and hot cocoa than I remember to give her. I’ll do that, tonight. But while I feel for her, I can’t be her. I can’t let her steer me around. She’s a terrible driver, and can’t see over the steering wheel. She can’t see the horizon. She can only imagine it. With this writing challenge, I catch myself up with, “but what will people think?” Can I really say that? What if someone doesn’t like it? What if I offend someone? Dude. If this blog causes pearl-clutching, I’m doing something horriby, horribly right. I just have to trust that a few people may find resonance with what I write, just like I find with a few of the other participants. Not all of them are writing for me, and nor should they, nor should I expect them to. I need to quit editing out all the juiciness in my writing, worrying over guessing what an imaginary person would like. I need to write for myself, and my own needs. It’s OK for art to serve the artist. The rest is gravy. Tasty, tasty gravy. This blog has been taken over by the 2018 Write 31 Days challenge. 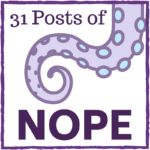 Here’s the wild and crazy index of all my posts of nope. This entry was posted in Anxiety, Blogging challenge, Depression, General, Post of Nope, Self care, Write 31 Days, Writers block, Writing challenge. Bookmark the permalink. Yes! Writing for ourselves is where the good stuff comes and the readers too. They’ll find themselves in what you write for yourself. Keep writing! I am loving this series so much! You don’t have your ‘like’ button activated, so I would like to go on record with a formal ‘like’ on this post. In fact, I love it. Thank you, Kara! I hope things are well with you. I can’t find your blog! I was so glad you stopped by, so I could stop my silly self from worrying. I was eyeballing the plugin The Bloggess uses for commenting, because it does allow for likes. However, I’m too cautious to try it until the 31 days are over. I’m afraid of breaking things. Aargh, that internal censor that wonders what others will think. If you’re writing about what’s heavy on your heart, it has to come out, and writing is the most positive outlet…apart from hiking I guess, but that’s out. Such a bummer. The first time hitting Publish can be terrifying, but if you know you’re writing for yourself and that it may even benefit others, super. The opposite is also true. I’m learning that even if nobody reads or likes or comments, ultimately, the exercise of writing has been therapeutic. Yes, exactly! The act of art is worthwhile in itself, regardless of perceived successful of the outcome.